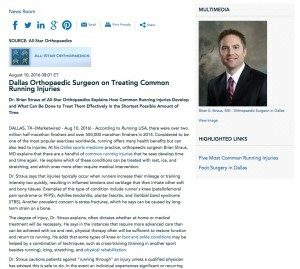 Dr. Brian Straus of All-Star Orthopaedics explains how common running injuries develop and what can be done to treat them effectively in the shortest possible amount of time. Dallas, TX — According to Running USA, there were over two million half-marathon finishers and over 550,000 marathon finishers in 2014. Considered to be one of the most popular exercises worldwide, running offers many health benefits but can also lead to injuries. At his Dallas sports medicine practice, orthopaedic surgeon Brian Straus, MD explains that there are a handful of common running injuries that he sees develop time and time again. He explains which of these conditions can be treated with rest, ice, and stretching, and which ones more often require medical intervention. Dr. Straus says that injuries typically occur when runners increase their mileage or training intensity too quickly, resulting in inflamed tendons and cartilage that then irritate other soft and bony tissues. Examples of this type of condition include runner’s knee (patellofemoral pain syndrome or PFPS), Achilles tendonitis, plantar fasciitis, and iliotibial band syndrome (ITBS). Another prevalent concern is stress fractures, which he says can be caused by long-term strain on a bone. The degree of injury, Dr. Straus explains, often dictates whether at-home or medical treatment will be necessary. He says in the instances that require more advanced care than can be achieved with ice and rest, physical therapy often will be sufficient to restore function and return to running. He adds that some types of knee or foot and ankle conditions may be helped by a combination of techniques, such as cross-training (training in another sport besides running), icing, stretching, and physical rehabilitation. Dr. Straus cautions patients against “running through” an injury unless a qualified physician has advised this is safe to do. In the event an individual experiences significant or recurring pain when running, he recommends they speak with a board certified orthopaedic surgeon. With a proper diagnosis and treatment plan, Dr. Straus says runners often will be able to return to their favorite activity faster and with better function while reducing the risk of relapse. 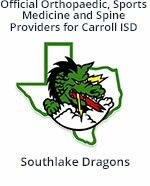 All-Star Orthopaedics is an orthopaedic and sports medicine practice located in the Dallas, Irving, Southlake, and Flower Mound area. Run by an extensively trained group of board certified orthopaedic surgeons, the state-of-the-art practice utilizes minimally invasive treatments to help children, teens, and adults reduce injuries, recover faster, and remain active without discomfort. The skilled medical team, which includes experienced physical therapists, provides patient-focused care at the on-site rehabilitation facility. For more information about All-Star Orthopaedics, please visit allstarortho.com and facebook.com/AllStarOrtho.